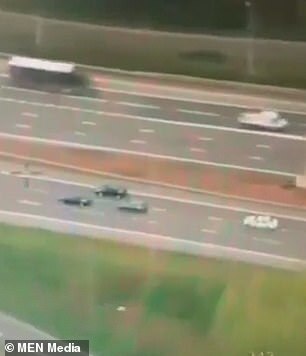 This is the satisfying moment a burglary suspect driving a stolen car is boxed in by officers after a high speed pursuit down a motorway. 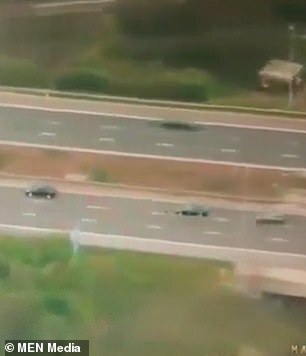 In the video, filmed from a police helicopter, the driver speeds along the outside lane of the M60 motorway, near Stockport, while being pursued by five police cars. 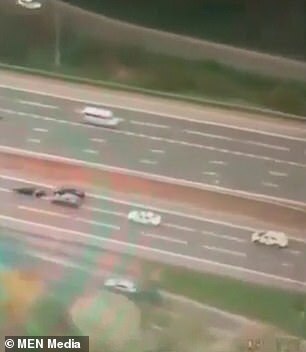 The leading pursuit car, which is unmarked, races ahead of the suspect car and then begins to slow down in front of it while another officer drives up alongside it. The officers then slow down further and narrow the space between their own vehicles and the suspected thief’s car, eventually forcing him to a complete stop. Two marked police cars which are following close behind then ensure that there is no chance of escape by driving right up behind the thief’s car. The 26-year-old man in the car was then arrested on suspicion of burglary and theft of a motor vehicle after the incident on Friday at around 1.35pm. A team of specialist officers had secretly pursued him after the car was reported stolen in the burglary. The arrest forms part of Operation Dynamo, which is an attempt to crack down on car thefts across areas of Greater Manchester. A spokesman from Greater Manchester Police said: ‘At around 13.35pm on Friday 14 April 2019, specialist officers covertly followed a car that was reported stolen after a burglary in Stockport. 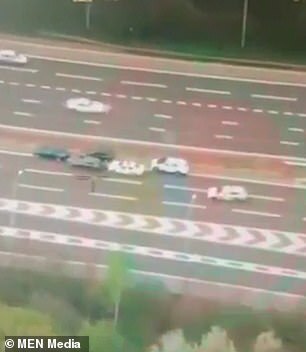 ‘A team of TVIU of officers used specialist tactics to stop the car on the M60 and arrested the driver – a 26-year-old man – on suspicion of burglary and theft of a motor vehicle,’ they added.